Help to discourage any attempt to cut or cap funds to Medicaid. Medicaid impacts the lives of millions. Share your story. Sign our petition to let Congress know how vital health services are to people with disabilities and their families. We see first-hand – in the work we do each and every day – how access to care can transform a family. Six years ago, the Forthofer family was in crisis. 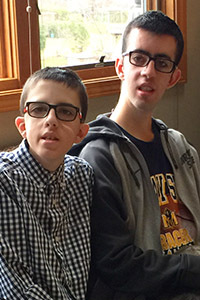 Their sons, Justin and Ryan, both have Myotonic Muscular Dystrophy and Autism, and the boys’ behavioral outbursts made them a danger to themselves, each other, and their sister. Today, the Forthofer's face a brighter future. With the help of Easterseals and Medicaid home-based services, both boys are making excellent progress, and are successfully living at home. Sign now and join us in making sure people with disabilities continue to have access to the services they need. I have a story to share about how Medicaid services have helped me and my family. Question - Not Required - What Medicaid service do you or the person you know receive? Question - Not Required - Why do you get the service? Question - Not Required - How has the service made a difference? Question - Not Required - What would happen if you no longer received the service? Question - Not Required - Thank you for sharing your story! Who can we share it with?